We arrived at Yentna Station at about 4:00 pm and started on our chores right away. I started up the cooker and began to melt snow. It took about 25 minutes to bring the water to a boil and prep the food–a mixture of raw meat, fat, and kibble. I then let it soak for about 30 minutes. I sat back and drank a Capri Sun and munched on “horse nuggets”. The snow machiners and the rest of the teams were in by now and I fetched my bale of straw to bed down the dogs. I set the team out on a drop line and removed their harnesses so they would be more comfortable. After feeding the dogs their ladle of gruel I went about checking all the dogs feet and give each one of the twelve dogs a quick once over looking for sore shoulders and legs. Everyone, including Marble, seemed to be A-Okay. By 5:30 all the mushers and snow machine guys were inside and figuring out where we were going to sleep for the evening. I opted for a room in the lodge while 10 people crammed into one of the cabins. The price was the same, 55 bucks, so you might as well be comfortable, right? Dinner was served at 6:30. An excellent Thanksgiving-type feast of turkey, mashed potatoes, salad and veggies and finished up with extra gooey brownies and ice cream. For the next several hours we all talked and told mushing stories while a few of the gang caught cat naps. A mushing check point is always respite with various people knocked out in chairs. We were no different. Joe was sleeping so soundly that Erin was able to mark up his nose with a Sharpie. Later in the evening, Dan, the owner of Yentna Station, broke out his 12 string guitar and rocked the place! This is why I came to Alaska. For evenings just like this. You won’t often find this type of hospitality in the big city. Here we were 35 miles off the road system along the banks of the Yentna River in the middle of nowhere and it felt like home. Yentna Station is ran by the Gabryszak family; Dan, Jean and their two kids. They are some of the nicest folks I have met in Alaska. 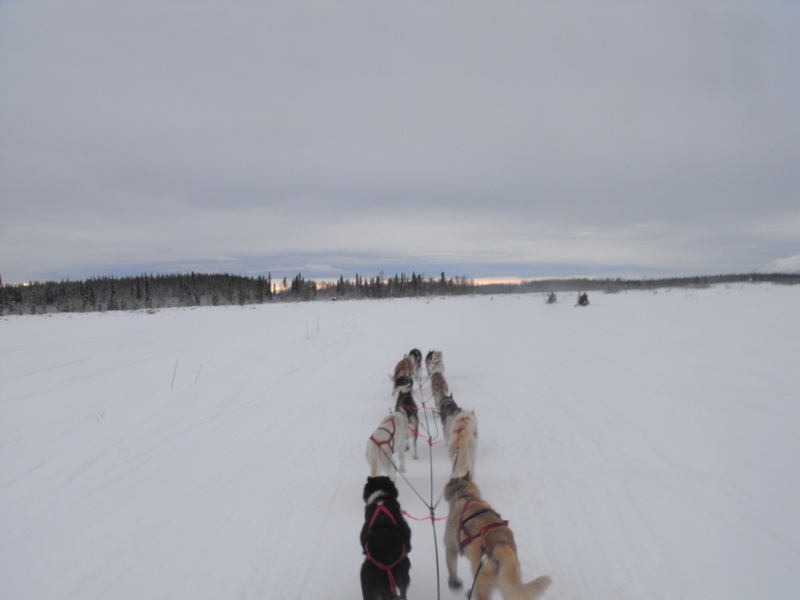 Not only do they open up their home to various passer-by mushers and loads of snow machines racing down the river, it is also the first checkpoint on the Iditarod trail as well as several other races like the Knik 200, Northern Lights 300 and the Junior Iditarod. By midnight most of us were retiring to our beds. I slept soundly and didn’t move a muscle until 6:45 the next morning, waking up to a symphony of the dog teams as the mushers began their morning rituals.